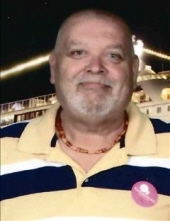 Celebrating the life of Jeffrey Thomas Meyer, Sr.
Obituary for Jeffrey Thomas Meyer, Sr.
Jeffrey Thomas Meyer, Sr., 63, of Cooperstown, passed away on Sunday, April 7, 2019 in his home, surrounded by his loving family. Born on December 3, 1955 in Avon Lake, OH, Jeffry was the son of Ruth Camp and the late Robert Charles Meyers. He was a graduate of Avon Lake High School. On July 9, 1982, Jeffrey married the former Sandra Rodgers; she survives him. For over 16 years, Jeffrey worked as a Manager for Rent-A-Center and was dedicated to his job. In his spare time, Jeffrey loved being outdoors, mostly playing sports. He was an avid golfer, loved football (he was a big Cleveland Browns fan), and coached and played softball. Most of all, Jeffrey cherished the time he spent with his family and was a wonderful husband, father, and grandfather. In addition to his mother and wife, Jeffrey is survived by his two sons, Jeffrey T. Meyer, Jr. (Lynn Osborn) and Michael Meyer (Loretta Umstead), both of Cooperstown; his two daughters, Nikki Meyer (Cody Clark) of Cooperstown, and Lisa Morrison (Josh Girty) of Oil City; his seven grandchildren, Destiny Stokes, Daithen Meyer, Daidree Morrison, Lynae Meyer, Piper Meyer, Bentley Mayner, and Brinton Mayner; and his brother, RObert Meyer (Jane) of Canton, OH. Jeffrey was preceded in death by his father and his five year old sister, Katherine Meyer. In keeping with Jeffrey's wishes, there will be no public visitation. A Memorial Service will be held to honor Jeffrey's life on May 4, 2019 at the Galloway United Methodist Church, 194 Seysler Road, Franklin, PA 16323, starting at 3 pm, with Reverend Roy Gearhart, pastor of the church, officiating. In lieu of flowers, memorial contributions can be made in Jeffrey's name to the Crawford County Hospice, 766 Liberty Street, Meadville, PA 16335, and/or to the Cooperstown Volunteer Fire Department, 152 N Main Street, Cooperstown, PA 16317. To send flowers or a remembrance gift to the family of Jeffrey Thomas Meyer, Sr., please visit our Tribute Store. Guaranteed delivery before Jeffrey's memorial service begins. "Email Address" would like to share the life celebration of Jeffrey Thomas Meyer, Sr.. Click on the "link" to go to share a favorite memory or leave a condolence message for the family.